Akihiko Kondo, a 35-year-old Tokyo school administrator, has married a hologram. 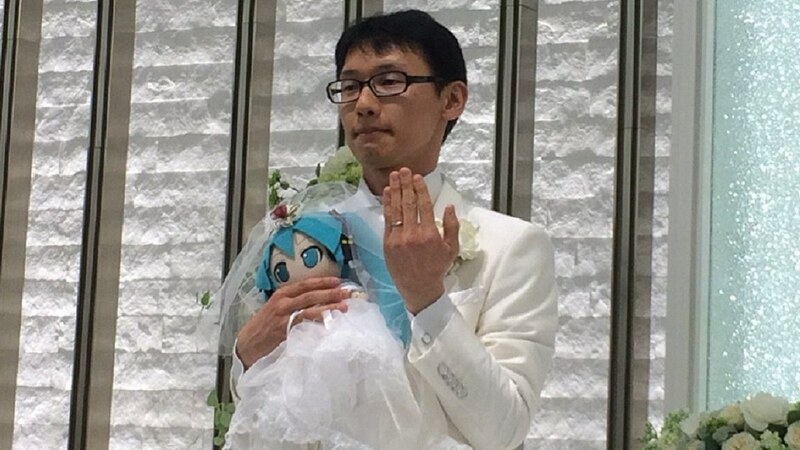 His new “wife” is a virtual reality singer named Hatsune Miku. The anime-like character is a 16-year-old girl with turquoise hair and pigtails created by Crypton Future for its Vocaloid software. Her voice is modeled after Japanese voice actress Saki Fujita. A company called Gatebox produces the $2,800 Miku hologram desktop device. Since Kondo was unable to place the wedding ring on the hologram’s finger, he used a Miku plushie as a stand-in at the ceremony. He even took the doll to the jewelry store to get the right size ring. It fits around the doll’s wrist. Kondo invited his mother to his two-million-yen ($17,600 US) wedding ceremony, but she refused to attend. She does not approve of him marrying a fictional woman. She wants him to meet and fall in love with a real person. Even though his mom did not show up, 40 other guests did witness the spectacle. Kondo has no interest in forming a relationship with a real woman. He has had trouble meeting girls for most of his life. “[In school] girls would say ‘Drop dead, creepy otaku!’” He told AFP. Otaku is a Japanese slur similar to "nerd" or "geek." It is usually applied to boys that are heavily into anime or computers. Later in life, he claims that female co-workers bullied him to the point that he had a nervous breakdown. Miku was the one he would turn to for comfort. Although his marriage is not legally recognized, Kondo does not care. In his eyes she is his wife, and he will remain loyal to her. He even has a “marriage certificate” issued by Gatebox stating that a human and virtual character "have wed beyond dimensions." As bizarre and crazy as Kondo’s story sounds, he is not the only one in love with the character. Gatebox says it has issued 3,700 such certificates, although Kondo is reportedly the first to have held an actual wedding ceremony. 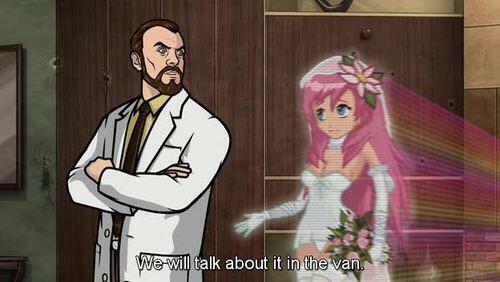 More like straight out of Archer. gusticles41, senketsu, Reehahs and 3 others like this. When you live in a country that thinks boys can be girls if they choose to, and vice versa, then you have no room to talk. Abigweeb, Kreegir, ForgottenLegion and 2 others like this. As if being a weebshit isn't cringy enough. Abigweeb, kombu and Evernessince like this. You speak as if we all allow it. By God, I'm not going to allow it. Once we visit a chopping block, I would then be fine with it. I was going to say "only in Japan" but heck, we have enough kooks in the USA as it is! I think the problem for me is that the guy is a school administrator and he feels like 'marrying' a fictional teenage girl character is entirely sane and appropriate in his job. This is the problem for me. The last few generations have been demeaning the concept of marriage. All because they have lost sight of what it means to be married. They have lost sight because the meaning is no longer taught. Kids the last 5 or so decades have been allowed to do as they please. And now parents can be jailed for trying to prevent them from doing as they please. ForgottenLegion, Reehahs and Vito05 like this. I will say, allowing people to marry anime characters is a great way to weed out the mentally unstable elements of society. I liked the song and the people looked like they were having a lot more fun than I am. 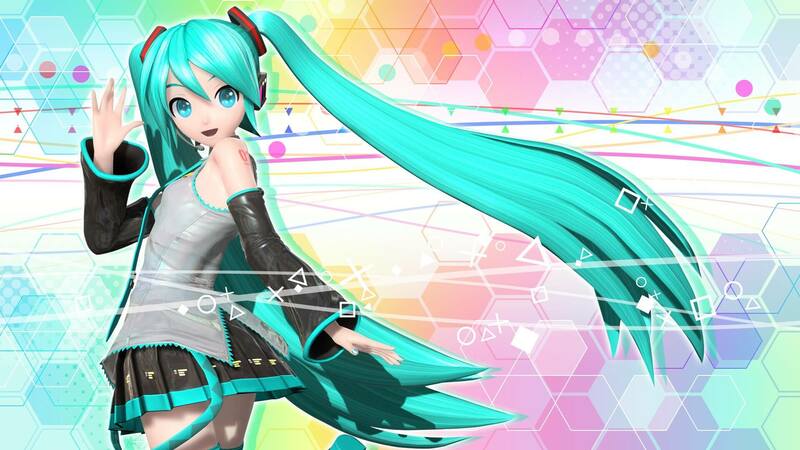 I learned about Hatsune Miko-san when reading up on the Vocaloid software (there are at least two other vocaloids). Then became interested in how they project her image on stage. If you watch the video, right at the end you will fairly clearly see the frame of a rectangle that she is in the middle of. This is the big part of what is used. Sorry don't remember more technical details, but if you are curious it's not hard to find. edit: the projection system is why she cannot move around the stage. In Japan, the social outcast harmlessly marries an anime girl. In the US, he shoots up a school. Apologies for the extreme example, but if the guy is happy and not hurting anyone...I genuinely don't care. Abigweeb, ypsylon and (deleted member) like this.
" I can only get so erect"
Fans of racing and anime!! Check here!